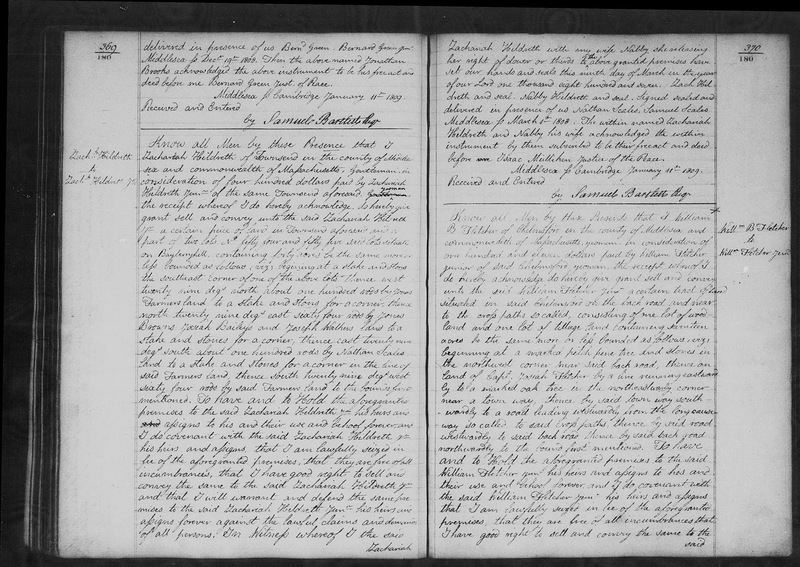 Genea-Musings: Amanuensis Monday - 1809 Deed of Zachariah Hildreth Jr. to Zachariah Hildreth in Townsend, Mass. 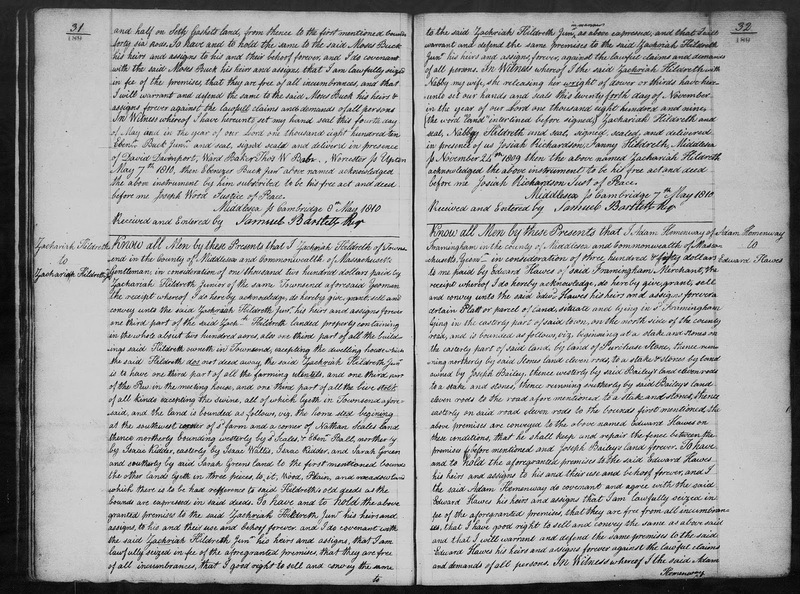 Amanuensis Monday - 1809 Deed of Zachariah Hildreth Jr. to Zachariah Hildreth in Townsend, Mass. me Josiah Richardson Just. of the Peace. Middlesex Ss Cambridge 2^nd October 1811. Received and Entered by Samuel Bartlett Regr. "Massachusetts, Land Records, 1620-1986," digital images, Church of Jesus Christ of Latter-Day Saints,FamilySearch (https://familysearch.org : accessed 23 September 2018), Middlesex County, "Deeds, 1811-1812, Vols. 194-196," Volume 196, page 238 (image 666 of 806), Deed of Zachariah Hildreth Jr. to Zachariah Hildreth, executed 24 November 1809, recorded 2 October 1811. Zachariah Hildreth Junior (1783-1857) was the son of Zachariah Hildreth (1754-1829) and his first wife, Elizabeth Keyes (1759-1793). This is the third land transaction for Zachariah Junior in the Middlesex County Deed index for 1800 to 1835.The land sold is 40 acres on Bayberry Hill in the town of Townsend, Massachusetts. It is 100 rods (550 yards) by 64 rods (352 yards), situated west-northwest to east-southeast, and was part of Lots 54 and 55 of the original land lots of Townsend. 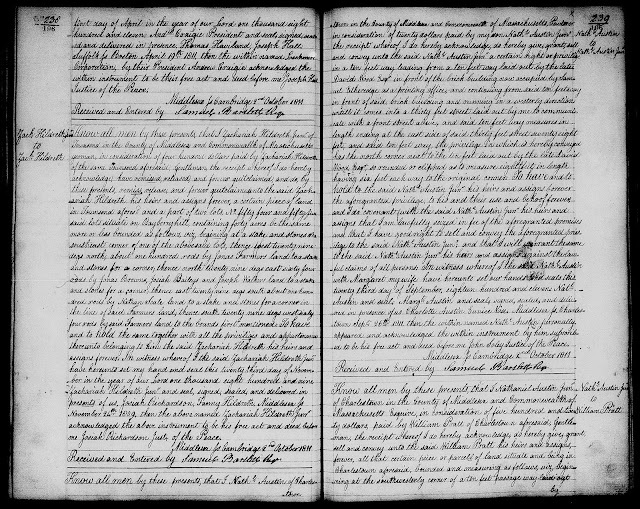 It is the same land that Zachariah Senor sold to Junior in 1807 for $400 transcribed in Amanuensis Monday - 1807 Deed of Zachariah Hildreth to Zachariah Hildreth Jr. in Townsend, Mass. This deed was executed on the day before another deed was executed, transcribed in Amanuensis Monday - 1809 Deed of Zachariah Hildreth to Zachariah Hildreth Jr. in Townsend, Mass. My guess is that Zachariah Senior decided to sell one third of his house lot (the 1809 deed) to his son Zachariah as part of a larger estate plan, and bought the first lot of land (the one sold in 1807) back from Zachariah Junior. At the time that this 1809 deed was executed, Zachariah Junior was not yet married. Zachariah Hildreth Sr. (1754-1829) is my 4th great-grandfather, and Zachariah Hildreth Jr. (1783-1857) is my third great-grandfather, who married Hannah Sawtell (1789-1857) in 1810. I am descended through their son, Edward Hildreth (1831-1899) who married Sophia Newton (1834-1923).